Tech Support Self Help - How can I submit an on-campus event? 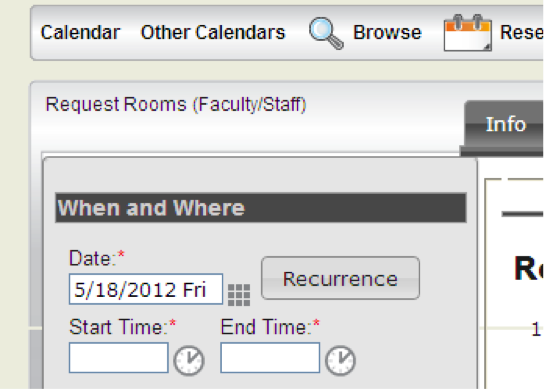 Click "Submit Event" on the Campus Calendar homepage or on the Calendar View page. Select "On-Campus Event" on the Submit Event page and click submit. Arrive at the Room Reservation Systems (EMS). 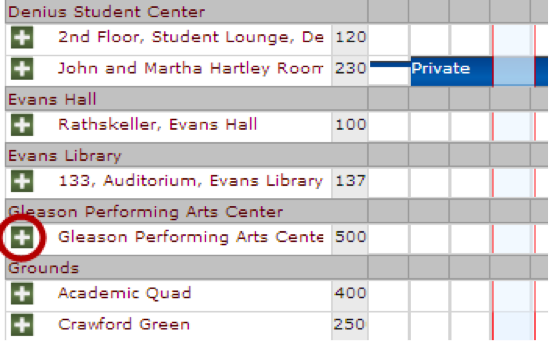 To hold an event on-campus a room must be reserved through EMS. Log in with your TRACKS ID. You will be redirected to the calendar page. 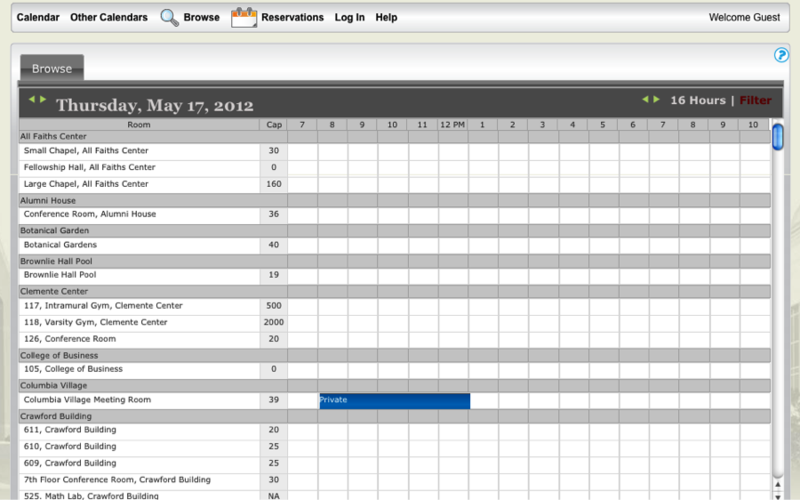 hover your mouse over Reservations option, and choose Request Room. In the When and Where box on the left-hand side of the page, enter the date and time for your event. Enter the EXACT times of the event as you want them to be published on the Master Calendar Events calendar. Keep in mind that faculty and staff can request a room up to 365 days in the future, but room requests must be at least 72 hours from the time of room request. If the request is less than 72 hours prior to the evnt, please conctact the Conference Services Bureau for assistance at x8125 or conference@fit.edu. Once times have been entered, you can choose a building from the Facilities drop-down menu if you know what venue you are looking for. OR, you can leave the Facilities on 'all' to search for all available venues. 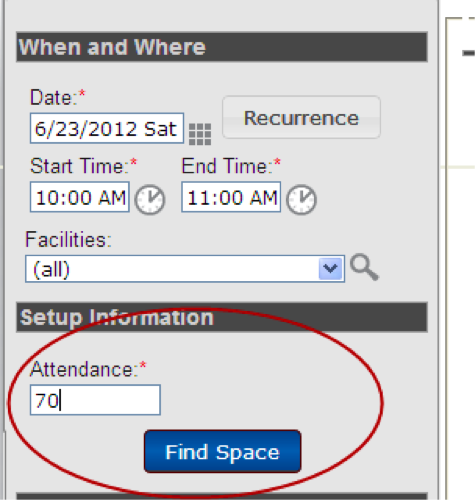 Enter the estimated attendance for your event in the Attendance box, and then click the blue Find Space button. Please note that the system will nto show you any venues which are smaller than your attendance. If you enter an attendance of 50, the system will not show you any rooms that seat less than 50. 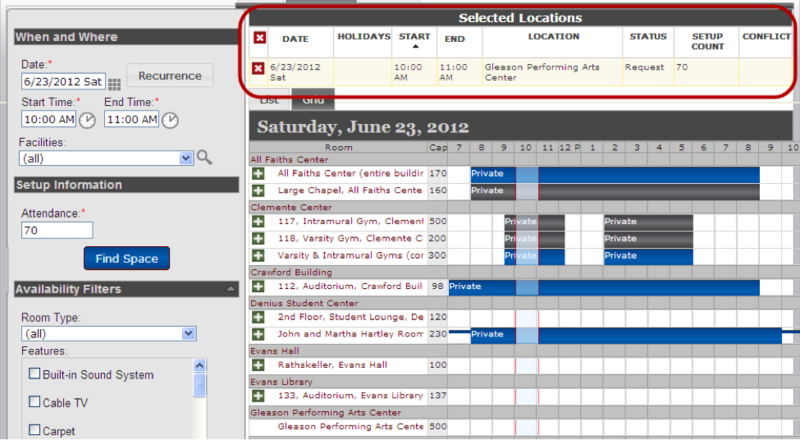 Once you have clicked Find Space, the system will show you all available campus venues, with two red lines to indicate your requested time. You can scroll through the list of venues and see which venues have events schedules, as indicated by the dark blue boxes. Either the EVENT Name or the word PRIVATE will appear on the blue box. Private means the venue is booked but the vent is not a public event. You can find out more about a room by clicking on the red room name. 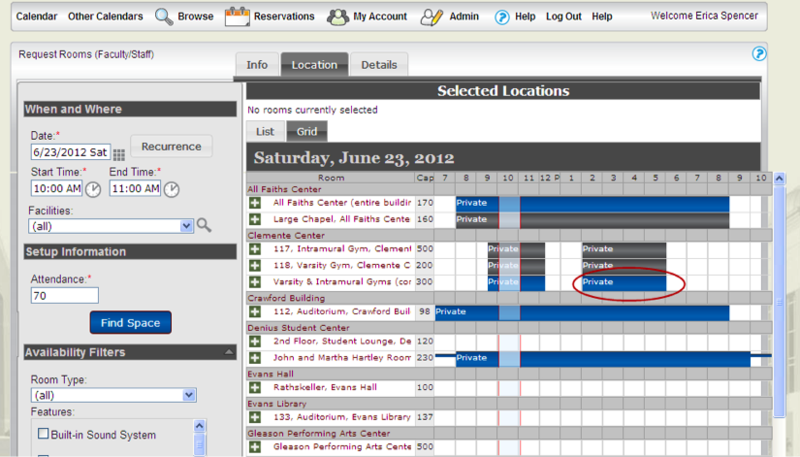 You can choose one or more venues for your event by clicking the green plus sign to the left of the room name. 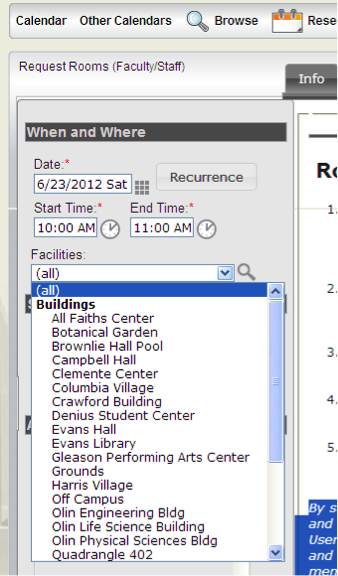 Once you have all venues selected for your event, click the yellow Continue button at the bottom of the screen. You will be taken to the Details area to enter the specifics of your event. you will need to eneter an Event Name, which will be displayed on the master calendar. Then you enter an Event Type, which is a description of the type of event you are holding. 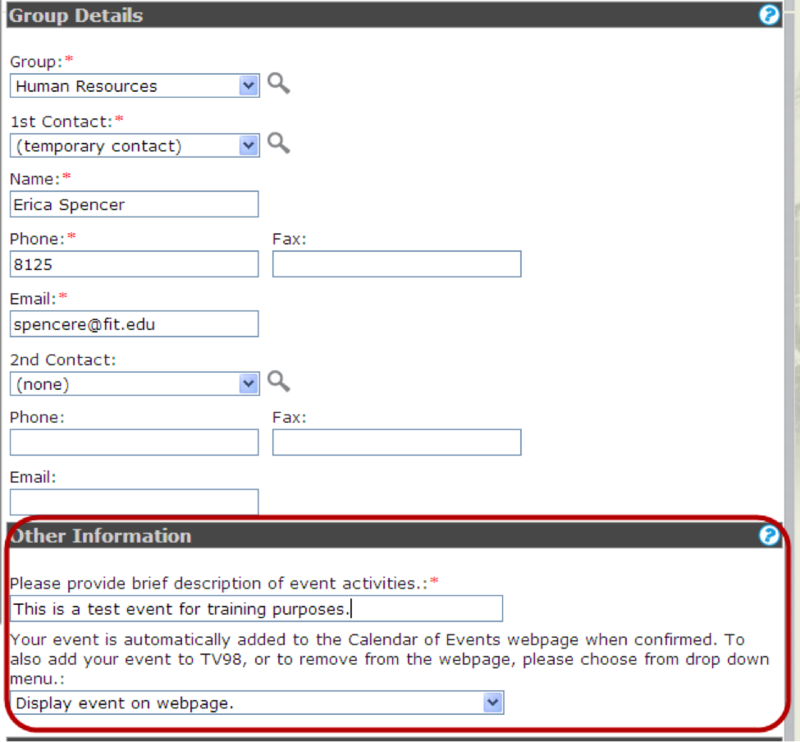 Next, you will need to choose a Group, which is the department or area that is responsible for the event. If this is your first time using the room request system, you will have to add a group. To add a group, click the magnifying glass next to the Group drop-down menu (shown in the image above). This will open the Item Lookup window. 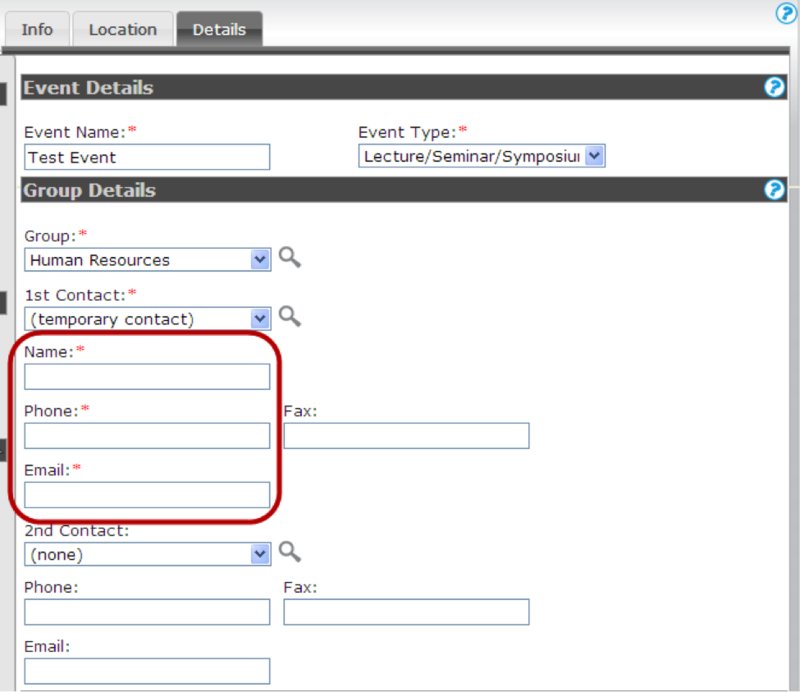 In the box, type the name of the group you are booking for (department) and click the magnifying glass to search. In the list that comes up, when you find what you're looking for, click the Green Plus sign next to the department you wish to select. 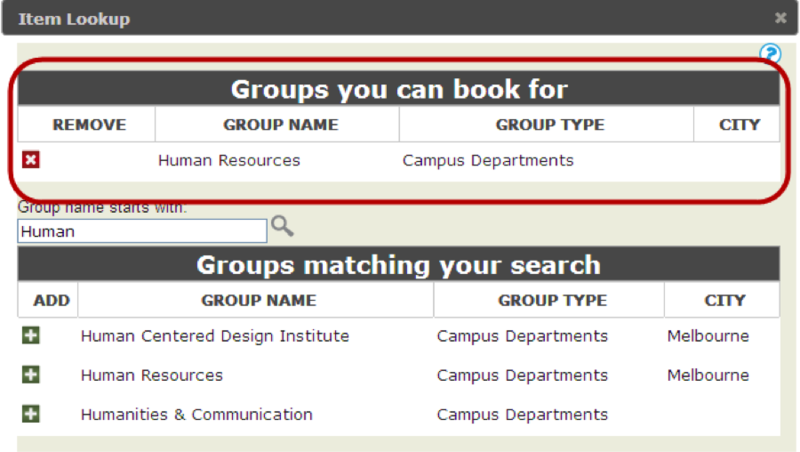 This will move that department into the Groups You Can Book For at the top of the screen. You can now close the Item Lookup screen by clicking the 'x' in the right-hand corner of that window. This will return you to the request form. You will find the group you just selected in the Group drop-down box on the request form and be able to select it from the drop-down menu. For future requests, this setup will not be necessary as the system will remember your selected group(s). You will not need to choose a 1st Contact for the event. This is the primary person responsible for the evnt, and usually the person requesting the room reservation. In the Other Information section, enter a brief description of the event, and choose whether you want the evnt to be displayed on the Master Calendar events. 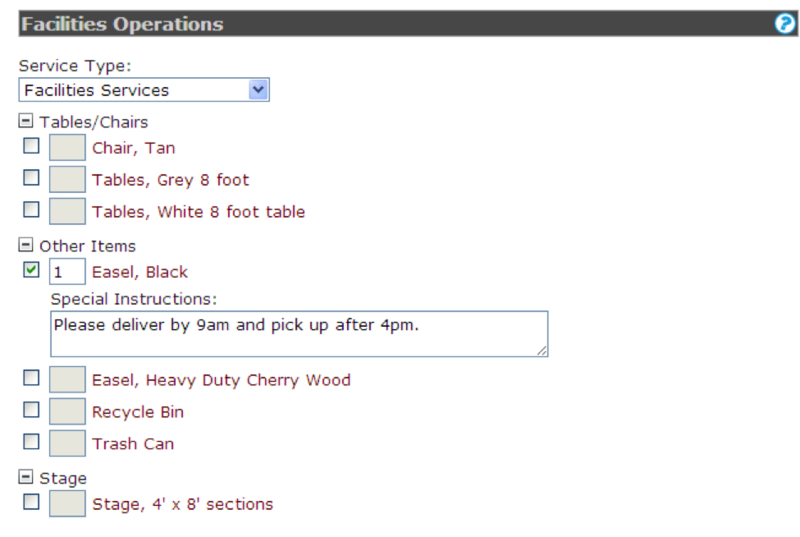 You now have the opportunity to request items from Facilities Operations, such as tables, chairs, and easels. If these items are needed, check the box and then enter the quantity you are requesting. 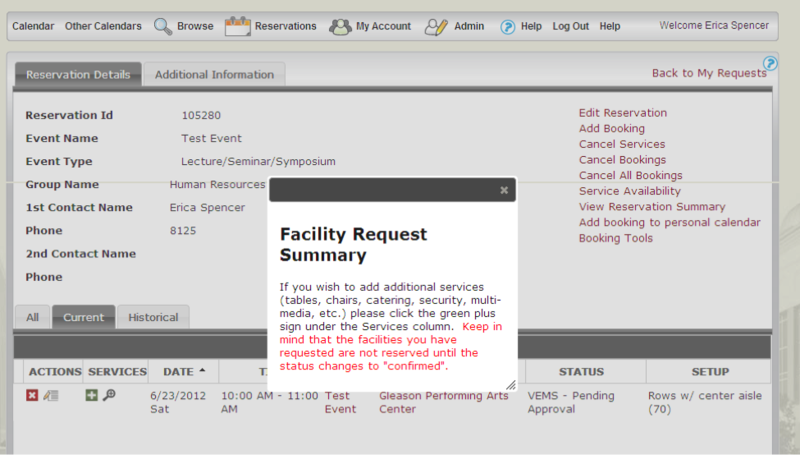 Click the yellow Submit Reservation button at the bottom of the screen to submit your reservation request. You will now see your Facility Request Summary. If the status of your event is Pending Approval, you will receive a confirmation email when/if the venue request is approved. If it is denied, you will receive an email explaining the reasons for denial. 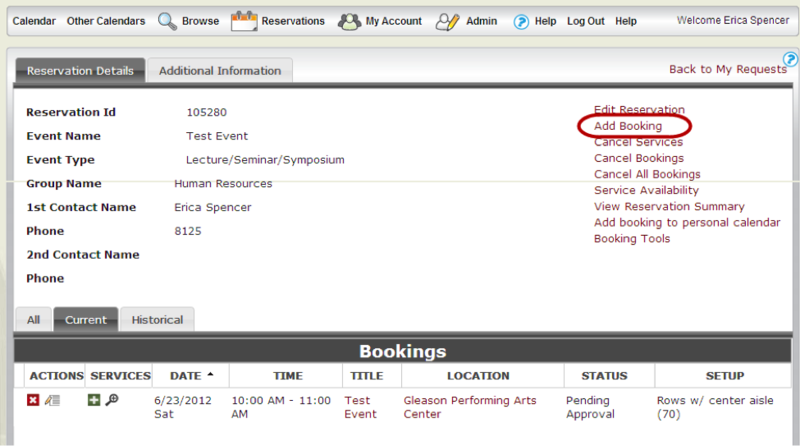 If your event needs setup time, you can add that to your event reservation from the current screen (image above). Choose Add Booking, a link in red at the top right of the screen. This will open a request rooms window, which looks identical to the original process for requesting a room outlined in details above. Enter the time for the setup of the event, click Find Space, choose the venue, and then click the yellow Submit Reservation button. You will see the new booking added to the list of bookings for this reservation. (Image below). 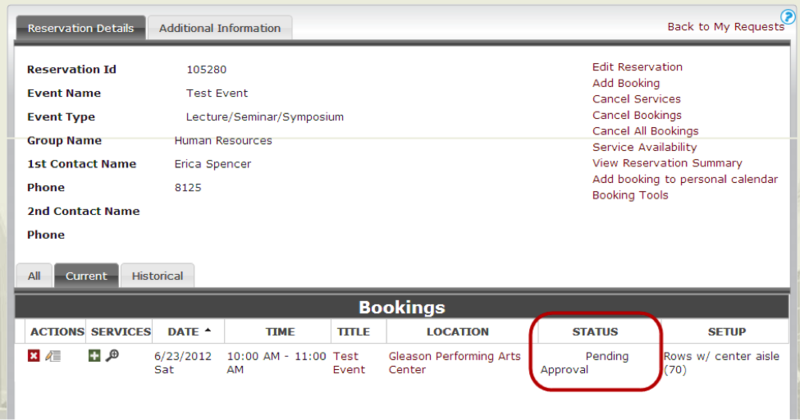 Click the Pencil icon under Actions column for this new booking. In the left-hand column, change the event type to Setup/Teardown. You may also edit the event name to include the word Setup. 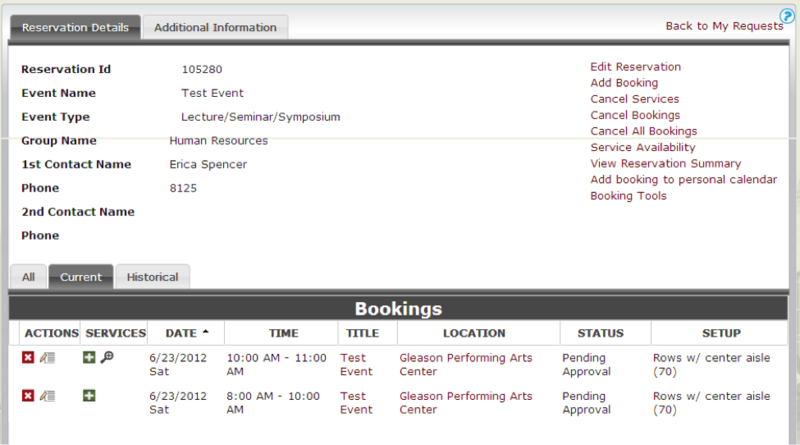 Then click the yellow Update Booking button at the bottom of the screen. You should see a box appear which indicates the booking was succesfully updated. You can return to the reservation summary by clicking the link in the upper right-hand side of the page. When you return to the Reservation Summary, you will see that your booking for setup has been updated.